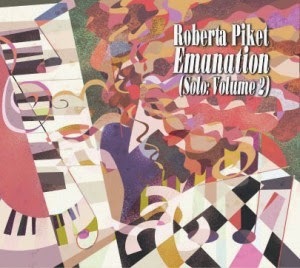 From the very first notes of the very first song “Softly, As in a Morning Sunrise” from Roberta Piket’s Emanation (Solo Piano Volume 2) one can hear the intent of purpose behind the pianist’s interpretation of this well known standard. This is the second of Ms. Piket's solo piano efforts and it is a further step in her maturation as a formidable player. As Richie Beirach, a superb musician in his own right, who is a one time teacher and now a long time friend of Ms. Piket states in the liner notes, a solo piano recording is very different from any other instrumental recording. There is no rhythm section to use as a life line, there is no interplay with others exploring the possibilities, there is only you and the piano and your own deepest, most personal sense of what it should sound like. Your ability honed to a fine edge, the result of years of painstaking practice, relentless dedication and patient listening . With this proficiency comes freedom to express the nuances that make all the difference. These are the paths that a musician like Ms. Piket has taken to be able to attempt to portray this music within the solo piano format. In every sense of the word Ms. Piket successfully takes up the challenge, leaving herself bare to express the music the way she hears it and she does so in a most personal and satisfying way. Listen to her deeply moving “Haunted Heart” and you’ll be swept away in shear sensitivity of her playing. Her choice of music is both interesting and challenging. Witness her kinetically alive left hand on Dizzy’s masterpiece “Con Alma,” an accompaniment that fills this robust piece with just the right amount of rhythmic drive. She delves into the abstraction of Monk’s “Ba Lue Bolivar Ba Lues” successfully bringing her own refined refraction to the quirky composition. On Jerome Kern’s “All the Things You Are,” Ms. Piket revels in the beautiful of the well worn melody and runs spectacularly across the keyboard in a display of fluid facility. On Marian McPartland’s “Ambiance,” a song not often heard, Ms. Piket captures a sense of reverence and her playing at the coda is a flourish of embroidered beauty not to be missed. “She confronts the challenge of performing "Actual Proof,” a Herbie Hancock piece from his electric funk days with the Headhunters. Originally a large group electronic piece, Ms. Piket’s syncopated stabbing and piercing attack pulls this one off with just eighty-eight keys and her own creative take on the sense of the song. but ultimately I have to agree with Mr. Beirach’s liner note assessment of the highlight of this CD. Ms. Piket ends the program with a re-imagining of Chopin’s haunting miniature “Fantasy on a Theme.” The ruminations on this piece are delightful, like the wanderlust of a child's first time exploring of a forest. Ms. Piket seems at once comfortable with bridging the gap between the classical and the improvisational possibilities this music can lead to. Spending fifty minutes, listening to an emerging talent's solo piano voice on Emanation is time well spent. Billie Holiday was as iconic a jazz and cabaret singer as has ever lived. The endurance of her legacy in popular culture is on par with Marilyn Monroe, James Dean or Frank Sinatra. She would have been celebrating her one hundred birthday this year on April 7th. Fittingly, many musical artists have been releasing their own take on some of her memorable repertoire. On Monday in NYC, there was an induction ceremony of Ms. Holiday’s name on the walk of fame at the Apollo Theater in Harlem. Singer Cassandra Wilson opened for her first time at the Apollo there on Tuesday, while simultaneously releasing her tribute album titled Coming Forth by Day. Coinciding with this event, Legacy Records, released a twenty song re-issue of some of Holiday’s most memorable recordings under the title Centennial Collection. 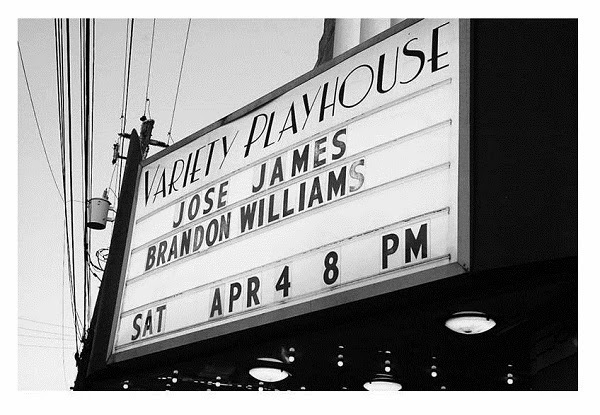 On a Saturday night before Easter the singer Jose James came to resurrect the spirit if not the sound of Miss Billie Holiday at the Variety playhouse in the Little Five Points neighborhood of Atlanta. Mr. James, a silky smooth baritone with a voice that is a mix between Lou Rawls and Johnny Hartman, has his own album celebrating Lady Day, titled Yesterday I Had the Blues: The Music of Billie Holiday. The show at the Playhouse was the start of his tour in support of the release of this new album. The opening act at the Variety featured the popular Detroit based trio of producer/drummer Brandon Williams. The core group of “Duke” ( just Duke) on electric bass, the talented Baron Davis on piano and keyboards and Mr. Williams on drums, played rhythmically driven series of songs with rotating lead singers. There were at least six different singers brought on to the stage and each offered a different take on vocalization, all in the neo-soul vein. The set opened with local talent Cleveland Jones. Songs from Mr. William’s latest album XII , included Matt Cuson singing “Everything”, powerhouse Anesha singing “I Love You” and free improviser Joi Tiffany stirring up the crowd with her stylizing free form vocals. Deborah Bond soared on “Make Believe” and the crowd pleasing Anesha returned for the finale. Despite the revolving door of singers, the music was a bit repetitive for me, with an excessive use of vocal gymnastics used by the singers in lieu of restrained soulfulness. Carrying notes into the stratosphere might be impressive to some, but can quickly be overbearing for me. Despite my reservations the crowd was thrilled and responded enthusiastically. This production by Mr. Williams was a crowd pleaser, but his use of the multiple singer formats gave the performance the feeling like one was watching singers compete in a talent show. Mr. James’ set started at a little past nine thirty. He was joined by Leo Genovese on piano and keyboards, Solomon Dorsey on bass and vocals and Nate Smith on drums. In each of his renditions of the Holiday songs, Mr. James interjects his own brand of modern sensibility. On “Good Morning Heartache” he uses the hip-hop technique of repeating words like a skipping record to enliven the old standard. Mr. Genovese was particularly creative with his solos, often extending the melody to parts unknown only to corral his excursions back to where they become familiar to the tune. Mr. James claims inspiration from Holiday and rightfully so. Perhaps his most direct claim to her legacy is his ability, like Holiday’s, to bring both pathos and sensuality to a lyric. On “Body and Soul” James sonorous baritone exudes a sense of sincerity that can be quite moving, but he also has learned that a sweet tone is not the only tool in a singer’s arsenal. He effectively employs unusual phrasing, a signature feature of the Holiday sound. As a singer steeped in the blues Ms. Holiday could make a song drip with mournful emotion and so too can James sing the blues. On “Fine and Mellow” Mr. James conjures the soulfulness of the great Low Rawls and Mr. Dorsey plays a mean and lowdown bass solo that rocks the house. Mr. James caressed the audience with a deeply sensitive version of “Tenderly,” which he named his all time favorite ballad. He continued with one of Holiday’s most memorable songs “Lover Man” which he treated using a modern vibe, repeating the song’s phrase “where can you be” in a hip hop inspired syncopated refrain. To many, jazz has become music of the mind instead of music that moves the body as it once did. Mr. James previous work promised that he would always have one foot in each world- the world of jazz and the world of neo-soul/funk. True to form, Mr. James took up his guitar and performed one of his earlier compositions, the easy swaying “Come to My Door,” from his popular 2013 album of the same name. His voice blended beautifully with Mr. Dorsey’s tenor creating a moving harmony. This is soulful pop music at its best. It was the start to a few crossover songs that successfully project Mr. James to his listeners that extend beyond the world of jazz. With a solid in the pocket groove laid down by drummer Nate Smith, James and company proceeded to do his own version of D’Angelo’s “One Mo’ Gin” to the delight of the crowd. The group immediately charged into James’ contemporary hip-hop “Park Bench People” from 2008 which he performed in a quick paced free style rap. Mr. James returned for a gospel inspired encore performance of the iconic “God Bless the Child. The man can make you come to Jesus with the power of his voice. He sang a soulful version of Sam Cooke’s “ A Change is Going to Come” accompanied only by his own guitar. Ultimately Mr. James finished his set with a startling a cappella rendition of “Strange Fruit.” Using rhythmic clapping and multiple overdubs of his own voice, James created an eerie, emotional y charged chant that gave the song’s content revived meaning. Mr. James codifies that he is not just another pretty voice. Much to his credit with Yesterday I Had the Blues: The Music of Billie Holiday the singer shows he has the ability to take well established material and energize it with his own contemporary style.